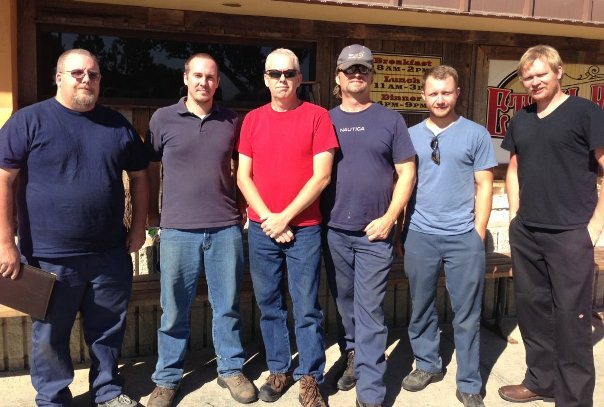 Former Teamster Shop Stewards, now IAM-represented workers at Lemoore, from left to right, Michael Maguire, Tyler Moriarty, Kevin Heaton, Joseph Koutny, Matthew Nelson and Daniel Todd. Election results speak for themselves, and few elections have been more eloquent than the recent vote by workers at Lemoore Naval Air Station (NAS) in Southern California. In a June 19 contest that pitted the IAM against the International Brotherhood of Teamsters (IBT), the IAM received a decisive 158 of 181 votes cast, with the employer receiving six votes and the Teamsters a mere 17 votes. The workers at Lemoore NAS are employed by a civilian contractor with pay and benefits defined by the Service Contract Act (SCA). The IAM is widely regarded as an expert in the SCA field, with a track record that includes hundreds of contracts negotiated on behalf of tens of thousands of contract employees. The decision by Lemoore workers to oust the IBT is the latest setback for the controversial and raid-happy union, which ironically holds the distinction of the most decertified union in the U.S.
Western Territory Grand Lodge Representatives Steve Cooper and Don Gresham along with members of the Southern California Organizing Task Force were directly involved in the organizing campaign for the workers at Lemoore.